THE STAHL CRANESYSTEMS SUPPLIES THE MOST COMPREHENSIVE RANGE OF HEAVY LIFTING PRODUCTS IN THE WORLD. THE SUPERIOR QUALITY IS SUPPORTED BY 115 YEARS OF THE EXISTENCE OF THE COMPANY. Stahl CraneSystems, whose history dates back to 1876, are produced with an emphasis on top quality. Worldwide, it is one of the highest quality. More about Stahl CraneSystems, their chain hoists and other products you can find here. 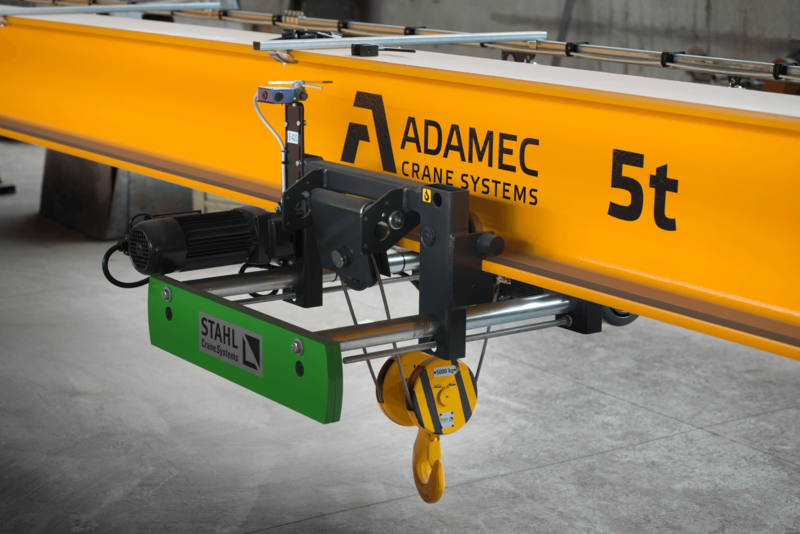 Hoists Stahl CraneSystems can be either wire rope or chain hoists, always with micro-lifting speed and micro-travel speed. They can also be equipped with a frequency inverter for a smooth change of lifting or travel speed. It will make it easier for you to lift heavy loads! STAHL CraneSystems wire rope hoists cover the SWL range (safe working load) from a lifting capacity of 500 kg to special open hoists with a lifting capacity of 250 t or more. The construction is based on a modular system that ensures efficient production while preserving the highest possible quality. The great advantage is that individual components can be combined so that each hoist fully meets the desired requirements. Regardless of whether it is a standard or special version. The attractive design of STAHL CraneSystems hoists features a compact, robust structure, and the hoists are extremely easy to maintain. They are also renowned for very smooth and precise start-up and braking. This is a hallmark of all STAHL CraneSystems products. STAHL CraneSystems chain hoists have a sturdy construction, exceptionally small dimensions and place low demands on maintenance. The ST type chain hoists are absolutely the best products in their class. This newly developed standard hoist combines intelligent design, state-of-the-art equipment and an attractive price-performance ratio.